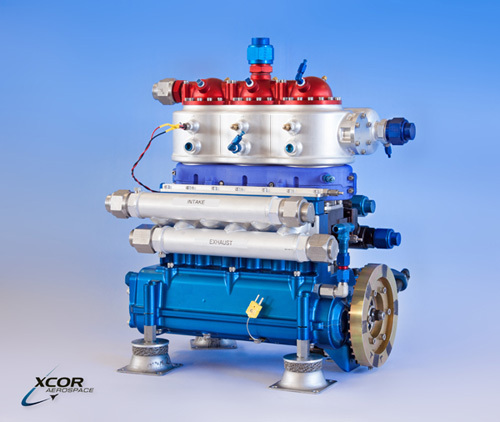 Yesterday, XCOR and United Launch Alliance announced a major milestone accomplishment in their joint project to develop a low cost, cryogenic propellant pump for upper stage applications. September 23rd, 2013, Mojave, California and Centennial, Colorado – XCOR Aerospace and United Launch Alliance announced significant progress today in the XCOR/ULA liquid hydrogen (LH2) engine development program. “We are happy to announce that we have successfully operated our liquid hydrogen pump at full design flow rate and pressure conditions,” said XCOR Chief Executive Officer Jeff Greason. “This milestone builds on our earlier success with liquid oxygen and kerosene pumps, which have powered many of our hotfires. Achieving this goal allows us to proceed with integrated testing of our liquid hydrogen demonstrator engine, fed by our liquid hydrogen and liquid oxygen piston pumps. The ultimate goal is a far more cost-effective upper-stage engine for ULA and their customers.” Conceived as a lower-cost, risk-managed program, the XCOR LH2 engine program is intended to produce a flight-ready cryogenic upper-stage engine in the 25,000 lbf thrust class with growth potential up to 50,000 lbf thrust or more. When complete, it should cost significantly less to produce and be easier to operate than competing rocket engine technologies. However, it isn’t just about thrust class. “Factors such as the extreme low temperature and small molecule size of liquid hydrogen present new technical challenges compared to liquid oxygen or kerosene,” said Greason. Note: Any reader of Innerspace.net will recall that ULA is frequently criticized for both its EELV pricing and monopolistic practices. It is good to see that in this instance at least, the company is making a positive contribution to lowering launch costs. In the long run, a vibrant, expanding launch industry is going to require at least two competitors with both equally engaged in the effort to progressively lower costs and increase re-usability, rather than using legislative influence to block competitors. We know who the first is, perhaps there may be another.